Garden Wars now available everywhere! Garden Wars is now out on PC, iPhone/iPad & Android devices! Garden Wars is a casual strategy game for all ages that's simple and addictive! Watch the trailer below, read the full details of the game, or just download now! Garden Wars is coming to Steam! Garden Wars was greenlit on steam today - thank you to everyone who gave it their vote! There's a couple of months worth of work to get it there (all going well), so we'll keep you posted closer to the time. More info about the game here. Our Next Game: Garden Wars! Morepork Games is proud to introduce it's new, upcoming game: Garden Wars! It is a casual strategy game for all that is simple and addictive, and will retail on Steam for under $5. There's a short trailer below and you can check out the Garden Wars page for more details! 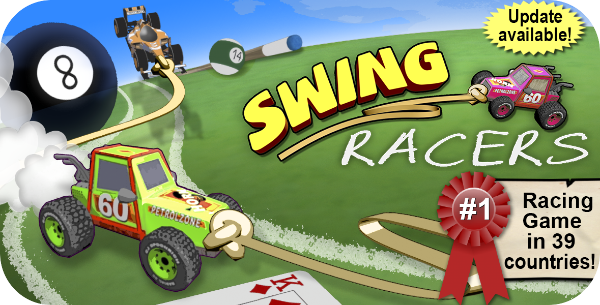 Swing Racers is on sale and featured again this week on the App Store in the "Amazing Apps & Games" promotion! The promotion is for Canada, China, Russia, India, Mexico, Turkey, South Africa, Indonesia and Australasia, though the game is on sale for the lowest price possible in all territories! Also, we've started work on the next game! Details will be scarce for a while yet but it sure is exciting to work on already! Swing Racers Update 1.1 Released! Update 1.1 is out now, featuring brand new tracks and cars! Swing Racers on sale! Update next week! There is also a new update coming next Monday - it features 20% more tracks and 50% more cars! One of the new racers is that pesky car you might recognize from Crossy Roads... it won't seem very special at first, but if you hit another racer you'll get a speed boost every time! Swing Racers Featured on the App Store! Swing Racers is now featured in the App Store's "Best New Games"! It is featured in 120 countries including most of Asia-Pacific, Europe and African countries! Notably, Australia, NZ, UK, Germany, France, Italy, China & Japan!